Looking to Decorate Your Home? Find Out How Much it Will REALLY Cost Here! Decorating a home is so exciting. Whether you are moving into a new home, setting out on your own, or just getting married it’s so exciting to decorate your new home. Everyone knows it costs money to decorate but most people aren’t aware of how much it actually costs to decorate an entire house. We found this article by Realtor.com that helps you determine just how much it will actually cost. Good luck and have fun decorating your new home! If you need Lafayette apartment associations vent cleaning services, then Dryer Vents Plus is your #1 choice! Call Jeremy Leake today at 225-612-7752 to schedule your 100% Free, No Obligation Quote! To get an idea of what finished rooms cost to complete, we asked top designer-owners of Decorating Den Interiors franchises in different cities to show us a single room they designed. They shared before and after photos, furnishing costs, and each space?? ?s challenges and advantages. You?? ?ll hear where they splurged and when they cut back, as well as additional tips to guide you through the process of completing a room. Challenges: This room already had a contemporary design but was nested within a traditional house. Also, the room had several openings, making it tough to arrange a functional layout. Finally, the home owners owned almost nothing other than the console. 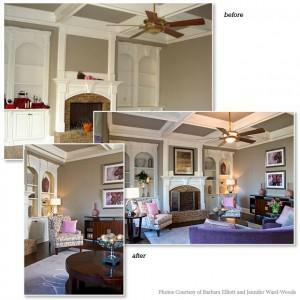 Advantages: The room already had attractive built-ins and a fireplace and had been painted a nice taupe gray. It had good hardwood floors and a ceiling fan. Solutions: With a modest budget of between $10,000 and $20,000, the design partners focused on purchasing a quality circular two-part sectional that would offer a lot of seating and anchor the room. They also purchased a pair of side chairs to flank the fireplace, a good area rug, and upscale silk window treatments, which are visible upon entering the foyer. The designers knew these purchases would last; they cut back on accessories to fill the bookcase. The designers also completed the room in two phases?? ?first choosing the upholstery, window treatments, rug, and one work of art, then introducing accessories and lamps later. Tip: Splurge on pieces that provide the greatest longevity and take the most wear and tear. ?? ?The sofa was custom-made, came with some pillows, and cost $3,300, but it was well worth it,??? says Elliott. Looking to remodel your kitchen? Checkout this article about kitchen remodel ideas for busy homeowners that could be of interest to you. This entry was posted in Helpful Articles and tagged Cost to decorate home, decorate home cost, Lafayette apartment associations vent cleaning, lafayette vent cleaning by Jeremy Leake. Bookmark the permalink.